[CHICAGO] — Roger Federer ended the year with a victory over Rafael Nadal 6-3, 3-6, 6-1 at the Barclay ATP World Tour Finals on Sunday in London. 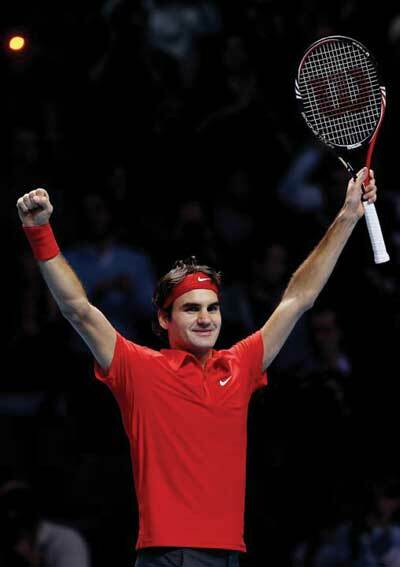 Federer, the undefeated champion, is the third player in the tournament’s 41-year history to win the title five times, joining Ivan Lendl and Pete Sampras, and the title gives Federer an unprecedented record with one Slam, one Championship, one Masters, one 500, and one 250 won in a single year. Using his Six.One Tour BLX racquet, Federer ended his post U.S. Open stretch 21-2, and looked as strong as ever. With the fifth year-end championship title of his career, Federer heads into the new year with his 66th career title in hand. In the Men’s doubles final, Daniel Nestor, with his Six.One 95 BLX racquet, ended the year on a high note as he celebrated the victory of the World Tour Finals for the second time. In the final match, Nestor and his partner defeated Mahesh Bhupathi and Max Mirnyi 7-6, 6-4. It is the seventh title of the season for Nestor, whose earlier triumphs include Roland Garros as well as Sydney, Rotterdam, Monte Carlo, Barcelona, Vienna, and now London. The success of the new BLX line of racquets has continued through 2010. Played by top players including Roger Federer, Juan Martin Del Potro and many more, BLX was the racquet of choice used to earn 59 titles on the ATP and WTA tours. BLX is just another example of how Wilson, the #1 brand in tennis, continues to provide pros on tour as well as millions of players around the world, with the most revolutionary technology.